This beautiful 8000 SF, Non-Smoking home is located on an elevated, seven acre lot in a gated community in the middle of ski country. You will be 10 minutes to Keystone and Copper, 20 minutes to Breckenridge, and 30 minutes to Vail. From the moment you enter, you will be overwhelmed by the attention to detail and the incredible views. Both the master bedroom and the family room have panoramic windows. The dining room also has a great view. At the end of the day, you can soak in an indoor soaking tub, refresh in the plunge pool or get more exercise in the full-sized heated indoor lap pool. 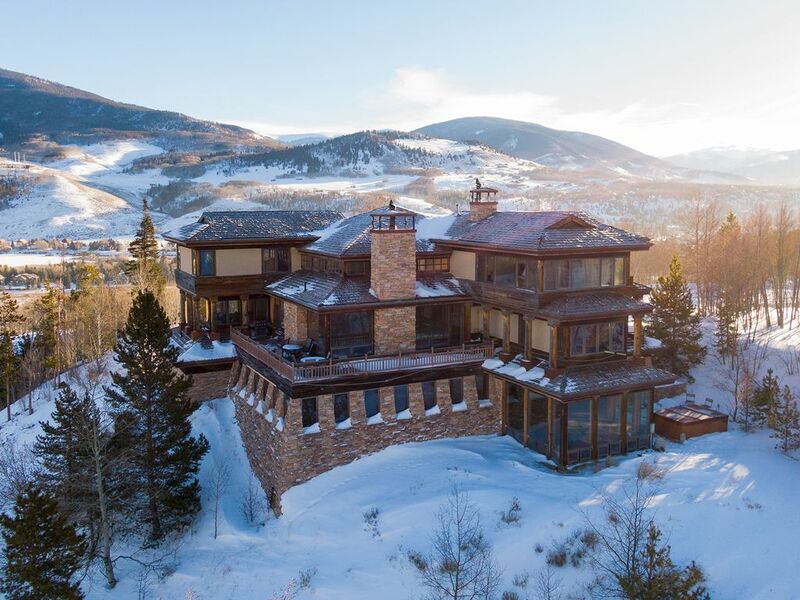 This property is one of the most beautiful mountain homes you'll find. THE HOME MAY BE AVAILABLE FOR LONG TERM RENTAL, 6 MONTHS OR LONGER. PLEASE CONTACT US FOR DETAILS. WEDDINGS NOT ALLOWED. Incredible home with magnificent views! We thoroughly enjoyed the house and all of its amenities. The hot tub, indoor lap pool, steam room and workout facilities made for a great stay. Very easy access to Vail, Breckenridge and Cooper Mountain. Great experience overall! The support from the owner was very responsive. The home was spacious and inviting but needs work. We enjoyed the large open living/kitchen area. We were there July 2018 for annual family reunion. The home can use refreshing such as replacing toilet seats that are cracked or worn, checking the appliances to determine if they are in proper working order. Some of the dining room chairs had broken bases which made them risky to sit in. The living room couch had no support and had several blankets under the cushions in an effort to make the functional. None of the pull out sofas had tolerable mattresses (one mattress was held together with duct tape) and some members of our party ended up sleeping on the floor. The pool filter was not operating as well as it should have been, I think it needed backwashed but when the pool guy came he spent less than 15 minutes and didn't seem to do anything about making it more functional.The indoor and outdoor hot tubs were fine. Overall we enjoyed our week there. It is in a beautiful location and we enjoyed all of the nature that surrounded us. The house needs some extensive cleaning and maintenance. I don't think I would pay that much money again unless I knew it had been cleaned up and repaired. Thank you for your anonymous comments. Issues can occur and we do our best to make it right however it's hard to address concerns if we don't find out about the concern until a month after departure. We employ a property manager and a pool service who are prepared to help with any issues. If you had simply mentioned your concerns to the pool technician he would have addressed it immediately. Additionally, you could have reached out to the property manager and/or the owner. All contact info is provided prior to check-in via email and in the house. Unfortunately, you did not give us the opportunity to address your concerns and arrived two hours late after requesting an early check-in. The owner accommodated your request and was personally waiting for you to conduct the check-in. While we were happy to facilitate a last minute independent self check-in due to your late arrival, a personal check-in & tour is often a good opportunity to answer questions and address issues. We encourage all guests to communicate with us so that we can try to ensure expectations are met and guests are happy with the accommodations! We would be happy to help! Our 4 generation family had a wonderful time. It was an amazing house in a very convenient setting. It is a really cool property, well equipped, and is in an incredible setting. I think, as with most things, a little tlc could improve this into an even more spectacular house. Noise violation 1st = warning. Noise violation 2nd =s $900.00 fine. Trespass violation = $900 fine. Pet violation = $900. Repeated violation for noise and/or trespassing will result in eviction and loss of all rents and deposits.